In order to fully appreciate the interaction between Cooley's award winning Grain whiskey and its interaction with the single used bourbon casks, a small batch release of Greenore 15 year old Single Grain whiskey has been hand picked by Cooley's Master Blender. This is the World's oldest bottling of Irish grain whiskey ever released. The 15-year-old bottling will be limited to just 5,000 bottles. 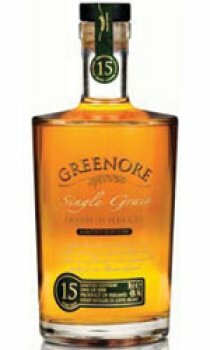 A unique and exceptional Single Grain Irish Whiskey, Greenore's silky smooth taste and robust character is a truly delightful experience for the discerning drinker.The extra aging of the Greenore 15-year-old produces a more complex robust whiskey with new depths and layers of flavours that compliment the smooth sweet buttery vanilla notes that makes the 8-year-old so popular. On it's first outing at the IWSC in 2009 with also won a gold and best in class to solidify its standing as a world class whiskey. Nose: Soft, sweet corn, delicious hints of vanilla, honey and oak. Taste: Melt-in-the-mouth richness, silky smooth honey start combining with fresh almonds and spices, a hint of barley for good measure. Finish: Warm honey taste lingers in the mouth with a dry finish.